Noe Display creates a lovely tension between providing what we expect from its genre and bringing a sting of surprise and joy along with it. A quick glance reassures us that this is definitely some­thing familiar. This is some kind of variation on a Victorian-era Fat Face. Because it is so familiar, what we need to read easily and also with pleasure is abund­antly there. It doesn’t take long, however, to realize that this isn’t quite what we thought it was. It is a much more pleasing, refreshing, and even sparkling thing than it seemed to be at first. Vendôme seems to have crept in. The result reassures and surprises by turns. It catches and keeps our eye. It makes us want more. The way Noe Display finds its balance between the novel and the expected is worth noting. The overall construction and stems are unsurprising. It is the ter­minals of letters and the swell of curves that deviate. Within the surprising elements of the design, there is also a strong contrast. On one hand, you have the tension and nuanced use of sensuality in the curves. On the other, there is the arch and almost brutal simp­licity of the triangular terminals. I think it is the quiet back and forth between these two novelties that grabs and then keeps our attention. This would be a fine accomplishment even if the type could only be used in short display-sized bursts of text. But thanks to its consistent and measured design, Noe Display excels in short paragraphs as well. 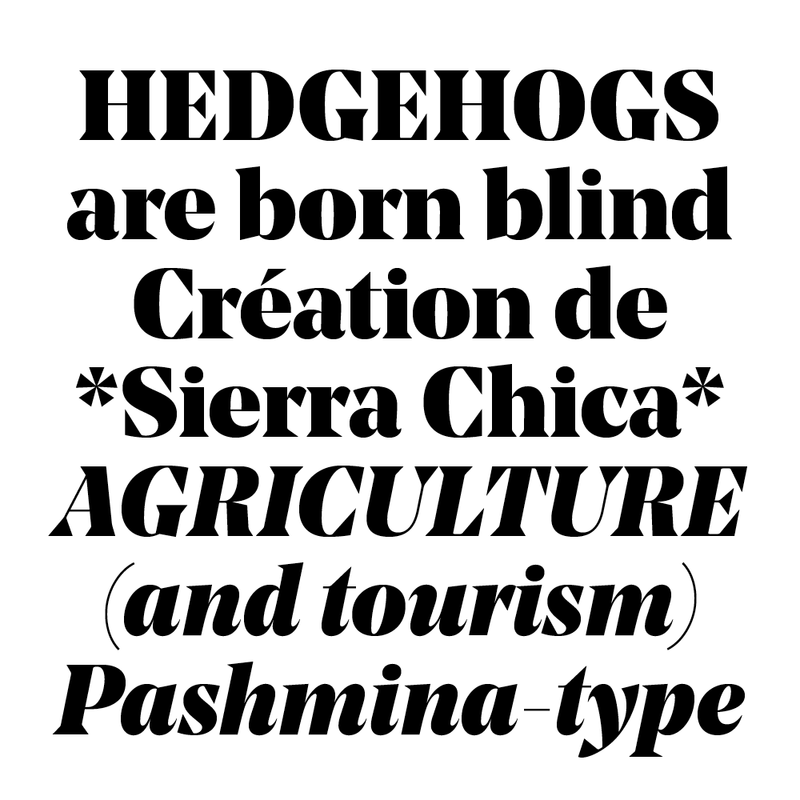 If Schick Toikka decides to release a version aimed at text, it will certainly be worth watching out for. Quite apart from the pleasure of Noe Display itself, I also enjoy the way it contradicts the people who some­times bemoan that a genre of type design is too satur­ated for meaningful new designs to emerge from it. Noe Display simply crushes this misguided thinking. Clearly we can push much further, and real value and excitement can come from it.